Proflexen is a food supplement designed for those who are looking to promote joint and bone health and optimize mobility. The product can be used by people of all ages, including those who are already suffering from arthritis and those looking to reduce the risk of joint degeneration. This is an advanced joint support formula that can help to boost overall mobility and flexibility of your joints. It can assist in preventing joint stiffness you may feel in the morning and protect the joints during challenging workouts. Who is the Manufacturer of Proflexen? The company behind Proflexen is Key Player Limited. Their main office is in Dubai, United Arab Emirates, but they handle their business and create supplements for customers worldwide. They are dedicated to professionalism and maintaining top quality across all products they make. Key Player Limited on creating health supplements that can help to boost various aspects of your health, as well as the overall state of your body and mind. Some of the other products in their portfolio are Thyrolin, Testolan, Green Coffee 5K, and Fast Burn Extreme. 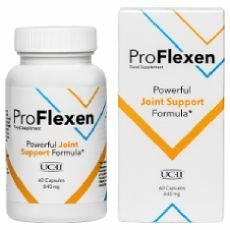 Proflexen offers a proven and complex formulation filled with ingredients that can support your joint health. One of the key compounds is UC-II collagen, a premium type of collagen essential for strengthening cartilage. This can promote flexibility and mobility and help to improve your quality of life and perform daily activities. The product also contains other ingredients that may help to relieve joint pain. Aside from that, Proflexen formula supports optimal joint function in the long run. It can help to maintain your mobility and prevent further wear and tear of the joints. Proflexen Ingredients – Are They Safe & Effective? Collagen – This is not just any collagen, but patented UC-II which is standardized to 25% total collagen. This compound plays a role in repairing damaged cartilage regardless of the cause of the damage. Some studies even indicate it is more effective than chondroitin and glucosamine, but Proflexen includes all these ingredients to boost potential benefits. Curcuma Longa Rhizomes Extract – A scientific name for turmeric, a known superfood whose potency comes from its active component called curcumin. It can act as a pain reliever in patients with osteoarthritis and also works on reducing other symptoms of the disease. Boswellia Serrata Resin Extract – It is most known as an anti-inflammatory agent which can help to reduce arthritis symptoms. This herbal-based ingredient also supports optimal flexibility of the joints and increases your motion range. Ginger Rhizomes Extract – Used in traditional and modern medicine and cuisines, this ingredients works on helping you to deal with morning joint stiffness and promotes overall mobility. Vitamin C – You’ve surely heard about the power of this antioxidant, but did you know that it boosts collagen production? Thanks to this, it can contribute to optimal cartilage function. The remaining compounds include chondroitin sulfate, methylsulfonylmethane (MSM), glucosamine, bromelain, papain, manganese, zinc, and selenium. As for the inactive compounds, you may find a gelatin capsule shell, anti-caking agent (magnesium salts or fatty acids), iron oxides and hydroxides, and titanium dioxide. What Are the Advantages of Proflexen? What Are the Disadvantages of Proflexen? After carefully analyzing the pain relief product, it seems that Proflexen doesn’t have any significant drawbacks. As long as you make sure to use it in accordance with the instructions, you should notice the maximum benefits of the product. How Should You Take Proflexen? The manufacturer recommends taking two capsules of the product every day. The preferred time of taking Proflexen is about half an hour before a meal. Make sure to take the capsules with a full glass of water. Each bottle contains enough capsules of Proflexen to serve you for a month. How Much Does Proflexen Cost? The price of Proflexen on the Official WebSite is $49 per bottle. However, there are bundle deals for multiple packs. If you buy two bottles for $98, you will get the third pack for three. The best value deal is a six-bottle bundle which costs $147. Please note that the shipping fee is $10 regardless of the package choice. What is Proflexen’s Return Policy? The return policy for Proflexen is valid for 90 days from the date of sending the product to your address. However, you need to contact the customer support first to receive confirmation. Upon that, you should return unused and used packaging to the company’s address to be granted a refund of the purchase price. Shipping fees are not covered by the return policy and the refund is only eligible for the first order you make through the Official WebSite. Does Proflexen Offer a Free Trial? At this moment, the manufacturer doesn’t offer a free trial for Proflexen, but the product is covered with a money-back guarantee. If you are looking for a reliable and proven pain relief product, you should definitely consider Proflexen. The product contains high-quality UC-II collagen which is essential to repair damaged cartilage and improve its function. This can boost your motion range and help you perform all sorts of physical activities without any troubles. Proflexen also includes chondroitin, MSM, and glucosamine, which are popular joint boosters. This further optimizes the formula and supports long-term joint health and optimal function. Ultimately, the advanced joint formulation offered by Proflexen is an innovative addition to the market that is certainly worth your while. The extensive list of ingredients in generous amounts make this formula reliable and the manufacturer seems to be certain in its effectiveness, too, since it offers a money-back guarantee for the product.